Typically our workshops range from a few hours to two days, with our one day workshops being the most popular. I find we can fill people’s minds with more than enough fresh information about photography in a day, but we don’t often get to experience what they do with that information. For our first ever 5 Day ‘Experience Thailand’ Workshop we were super blessed to have three lovely ladies return to Chiang Mai to be immersed in photographing elephants, models, dancing, monks, ethnic minorities and all the while showing us how much they had progressed in their photography since participating in a few of our short workshops a year ago. 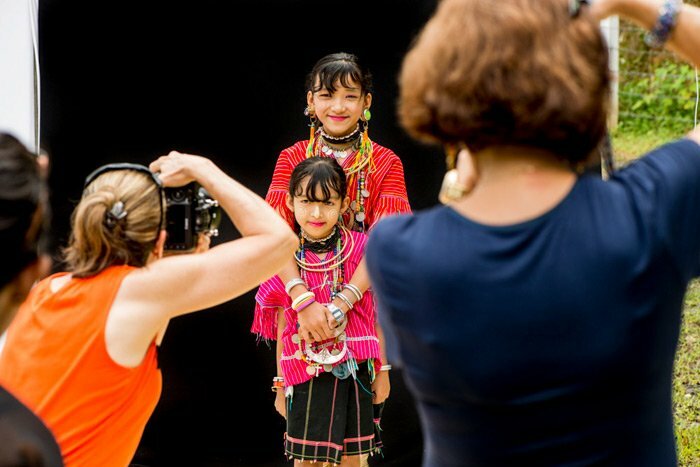 Our ‘Experience Thailand’ workshop is designed to offer participants unique opportunities to photograph a lot of models. We know of no other travel photography workshops or tours which provide this in the same way. 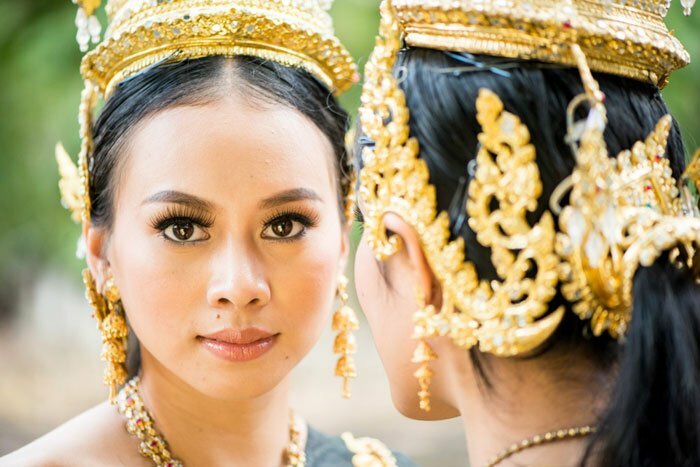 Thai people are generally comfortable being photographed, so when we have beautiful young women dressed in stunning traditional costumes with their hair and makeup looking perfect, great photos are produced with ease. 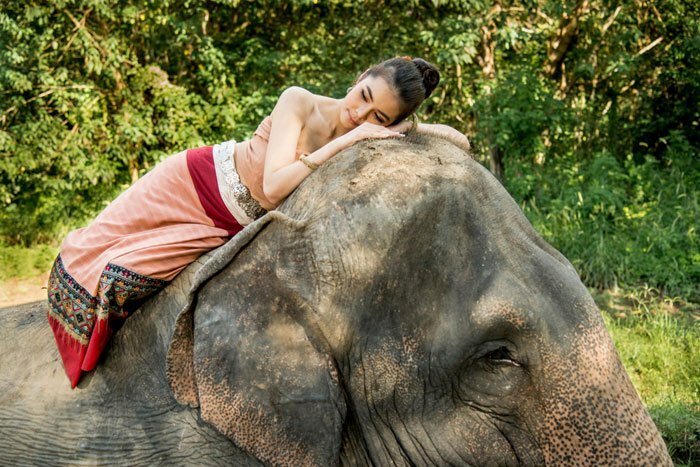 For some variety we had a session with two models together one with an elephant. When we asked our model if she was prepared to climb up and lie on the elephants she replied that she was scared, but that she would do it! I love that commitment! Pansa had organized all the logistics exceptionally well and most all went to plan. We love to have a mix of control and spontaneity during our shooting sessions, as it provides for more variety, and in each session we were able to achieve this. One problem we had, which was well out of our control, was the weather. November is the start of the dry, cool season in the north of Thailand, so we thought we’d be safe. We were wrong. However, there was not much rain and it only really disrupted one of our shoots. Pansa made up for it by quickly organizing another model to attend an extra shoot which resulted in some excellent photos. Overall with our workshops, we tend to avoid very touristic events and locations. For this longer workshop, we had included one or two sessions at touristic places and were encouraged by the outcome not to do this again. Dealing with large numbers of people who have no regard for when you are wanting to take a photo is tedious and the dinner and show we’d booked provided little opportunity to shoot as it was very lack luster. For future Experience Thailand Workshops we’ve done a little re-shuffling of our itinerary as we are always looking to improve our service. Working together with these three passionate photographers was a fabulous experience for us. For them to share the excitement and creative energy with us was a real gift. To see how their skills and style is developing serves as a strong motivation to work on building up more of an online community so we can participate in encouraging everyone who takes part in our workshops beyond the time they spend with us here in Chiang Mai. If you are interested in joining one of our five day Experience Thailand workshops, please take a look at this page.